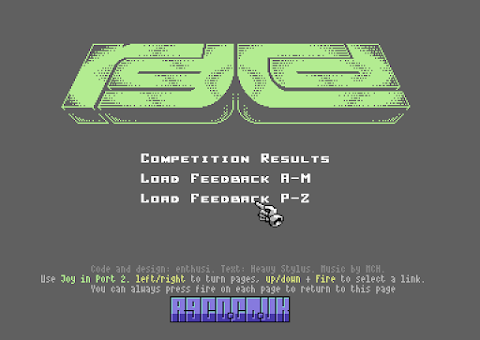 Download the results disk (including VICE emulator) here. Download all the games in a single archive here. "Well, that wasn't easy. In fact, I'd say that the process of fairly judging this year's competition entries was actually harder than any of the previous rounds. But as always, someone ultimately has to take the prize, and someone has to walk away knowing that their game was liked the least by the panel. 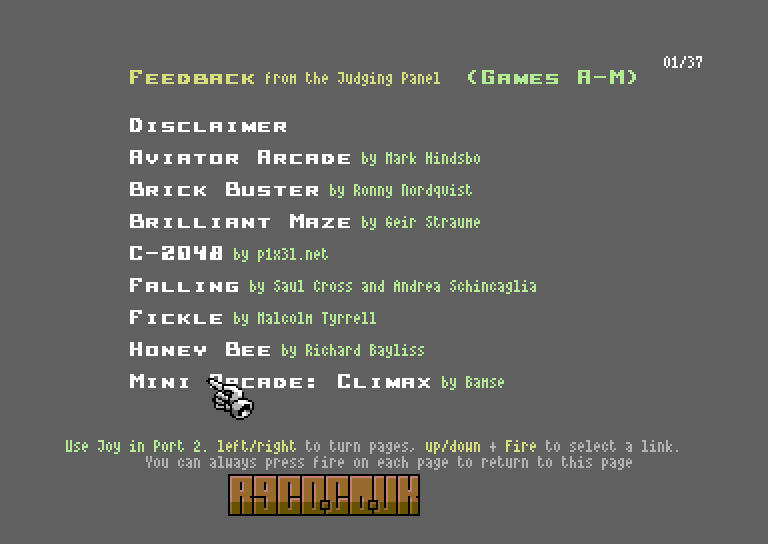 With 12 judges and 17 games, the sheer volume of feedback from our panel has been a little problematic - we'd planned to announce the results using Enthusi's 'Above and Beyond' single-file diskmag format, but no matter what we edited or cut, we still couldn't fit it all in. 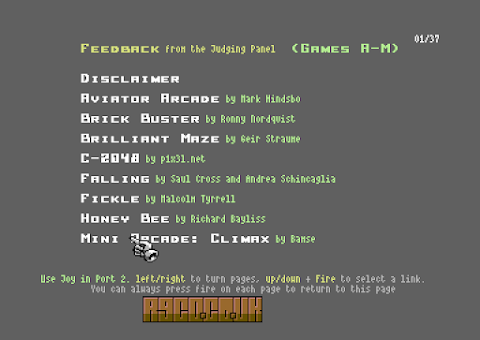 Similarly, running at over 34 A4 pages in length, listing it all on our blog was going to be a nightmare as well - so in the end we decided to break down the results announcement into three files on this disk; the introduction and results article you are reading now, plus two files with the judge's feedback for each game given in alphabetical order. A lot of work went into presenting this is a readable manner (mostly by Enthusi) so I hope you find the end result worth the wait! One of the things that I find so exciting about running this competition is that I'm constantly amazed at what can be achieved using that tiny 16KB of ROM, and I have no doubt that future years will continue to surprise and impress. 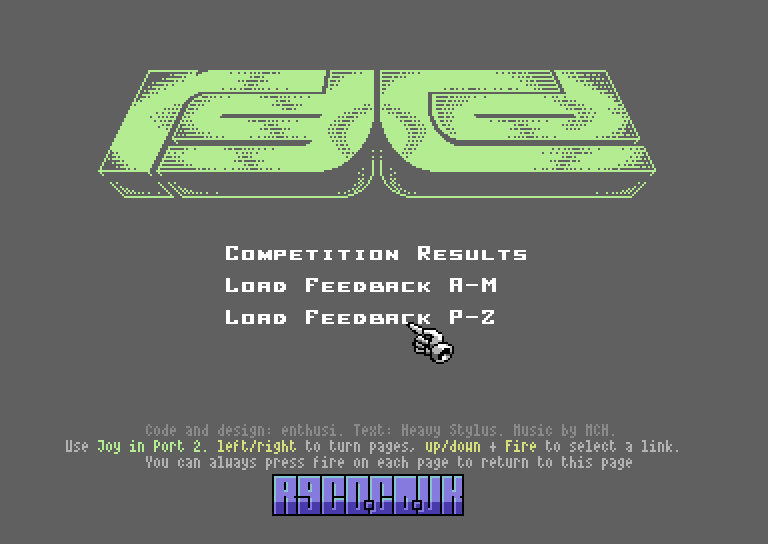 It was also really great to see so many new names in the list of entrants this year, for some of whom their game is their first production on the Commodore 64 (and for many, it's their first for many years). Hopefully we'll see more stuff from you guys in 2015!"